Larry Friese was born in 1942 in Huron, South Dakota. After graduating from the University of Washington with a degree in Oceanography, he joined the U.S. Marine Corps and attended The Basic School at MCS Quantico, Virginia, from June 26 to December 16, 1965. Lt Friese then completed Naval Flight Officer Training and Bombardier/Navigator training before serving as an A-6 Intruder bombardier with Marine Attack Squadron 225, VMA(AW)-225, of Marine Air Group 14 at MCAS Cherry Point, North Carolina, from November 1966 to June 1967. He then joined VMA(AW)-533 of Marine Air Group 12 in Southeast Asia, where he flew 138 combat missions between July 1967 and February 24, 1968, when he was forced to eject over North Vietnam. Capt Friese was captured and taken as a Prisoner of War 4 days later. After spending 1,842 days in captivity, he was released during Operation Homecoming on March 14, 1973. Friese transferred his commission to the U.S. Navy on June 5, 1974, and attended the Naval Postgraduate School until December 1976, where he received his Masters Degree in Meteorology and Oceanography. CDR Friese then served at a Fleet Weather Center on Guam before serving aboard the aircraft carrier USS Midway (CV-41) until 1980. 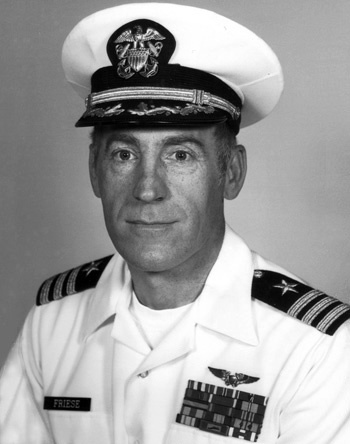 His final assignment was with the Fleet Numerical Oceanography Center at Monterey, California, where he served as a Department Head until his retirement from the Navy on June 30, 1985. 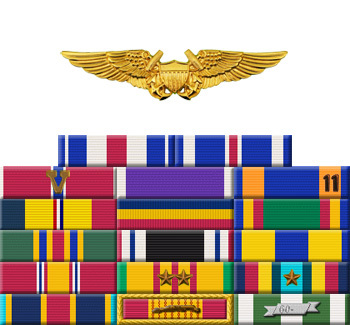 For conspicuous gallantry and intrepidity from February to November 1968 while interned as a Prisoner of War in North Vietnam. Despite the fact that he was consistently maltreated and subjected to severe cruelties, Captain Friese refused to cooperate with his captors in any manner. He displayed an exceptionally high degree of determination and resolve and provided his fellow prisoners both an example to emulate and a source of encouragement. Fully aware his resistance to the enemy would arouse increased wrath and harsher treatment, he nonetheless persevered in his resistance. Through his exceptional courage and determination in the face of extreme adversities, Captain Friese reflected great credit upon himself and upheld the highest traditions of the Marine Corps, the Naval Service, and the United States Armed Forces.